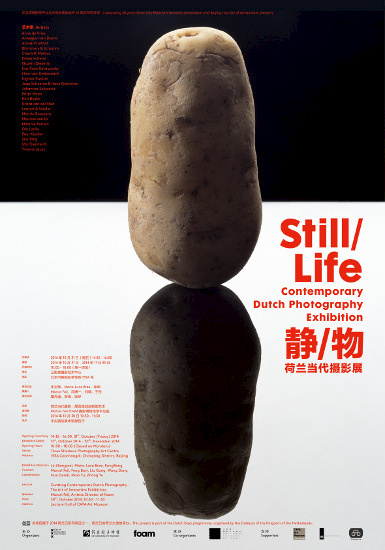 After a successful exhibition: The Space Between Us organized in collaboration with He Xiangning Art Museum in Shenzhen in the spring, the Amsterdam based photography institution Foam now presents a second exhibition with He Xiangning Art Museum in China: Still/Life – Contemporary Dutch Photography. The exhibition curated by Marcel Feil, Feng Boyi and Liu Gang, will be shown at the prestigious Three Shadows Photography Arts Centre in Beijing as of 31 October 2014. Celebrating the 20 years Sister City relations between Amsterdam and Beijing, the exhibition is also part of the Dutch Days in Beijing. The exhibition will be opened in the presence of Amsterdam mayor Eberhard van der Laan. On October 30, Marcel Feil will give a lecture on this exhibition at CAFA at 10.30am. The group exhibition Still/Life – Contemporary Dutch Photography is centered on the art historical theme of the still life and comprises works of a large number of emerging and established Dutch visual artists. The autonomous and commercial work of Dutch photographers has a recognizable, fresh style that is also characteristic of so-called Dutch Design. The latter refers to a typically Dutch aesthetic taste that is minimalist, experimental, innovative, unconventional and with a touch of humor. A major aspect is that instead of taking photos as a representation of reality, many of today’s photographers take photos entirely staged. Particularly the art historical concept of the still life continues to inspire, albeit in a modernized and updated format. The Potatoes series by Anuschka Blommers and Niels Schumm is a typical example. Given the choice of photographers, the show forms a survey of the talent that Foam has discovered, followed and presented since 2001: Melanie Bonajo, Kim Boske, Blommers & Schumm, Elspeth Diederix, Annegien van Doorn, Fleur van Dodewaard, Uta Eisenreich, Maurice van Es, Marnix Goossens, Eva-Fiore Kovacovsky, Paul Kooiker, Anouk Kruithof, Yvonne Lacet, Ola Lanko, Lernert & Sander, Charlott Markus, Katja Mater, Krista van der Niet, Jaap Scheeren & Hans Gremmen, Scheltens & Abbenes, Diana Scherer, Johannes Schwartz, Ingmar Swalue, Anne de Vries and Qiu Yang. Museum management and cooperation is a focal point in cultural exchange between The Netherlands and China based upon the three-year cultural MoU signed between China and The Netherlands in March 2014. It has also been one of the fields of cooperation between Amsterdam and Beijing for many years. The exchange aims to strengthen both countries’ museum sectors via seminars, trainings and exhibition exchange among other activities. In conjunction with the exhibition, CAFA Art Museum and Foam also organize the Forum “Museum Management in the World of Photography” at the lecture hall of CAFA Art Museum on 30 October 2014. The Keynote speakers include: Marie-Luce Bree, Deputy Director of Foam; Pjotr de Jong, Creative Director of the Amsterdam based creative agency Vandejong; Zhang Zikang, Deputy Director of National Art Museum of China (NAMoC); Wang Huangsheng, Director of CAFA Art Museum; Rong Rong, Director of Three Shadows Photography Art Centre; and Cai Meng, Curator of CAFA Art Museum. The Forum will focus not only upon the artistic side of a museum but more specifically on how to build a museum on a management level. Vice mayor of the city of Amsterdam, Kajsa Ollongren, will give a closing speech. Curators Feng Boyi and Liu Gang will be moderating. Courtesy of the artists and Three Shadows Photography Art Centre, for further information please visit http://en.threeshadows.cn/.